Fashion Star is ABC’s new reality show where designers compete to have their designs sold at H&M, Macy’s and Saks Fifth Avenue. Each week, the stores choose the items they want to carry. The selected items are available online right after the episode airs and in stores on the following day. Click here for details. So far, the show has pretty low ratings, but sales of the items are strong, with most selling out in just a couple days. In Episode 2, (airing Tuesday 3/20). 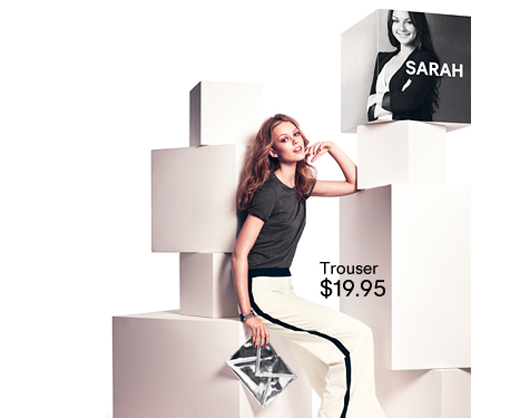 H&M bought tuxedo-stripe trousers by Sarah Parrott. 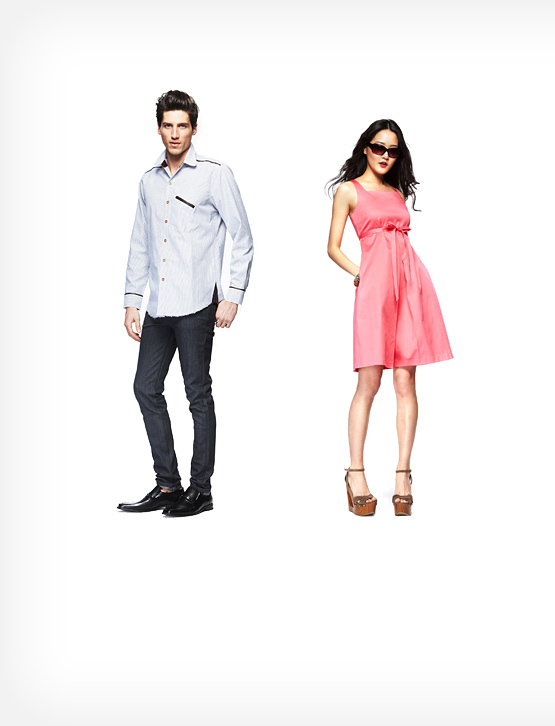 Macy’s bought a dress by Lisa Vian Hunter and a shirt by Nzimiro Oputa. Saks bought a shift dress by Kara Laricks. Saks has a Fashion Star kiosk prominently displayed on the first floor of the store, in front of the contemporary section. The display has a large graphic of the show logo with details about the program, a TV looping though clips from the show, a mannequin wearing the Episode 2 item and a rack with all the Fashion Star items carried by Saks. The store only gets one piece in each size, so you’ve got to move fast if you want it. I was able to try on the Kara Laricks shift dress. The construction was flawless and the fabric had a nice weight, felt great and hung beautifully. The dress is versatile – tie it different ways for different looks. I wasn’t a fan of the gray plaid print for summer in Houston, preferring the red fabric shown on the runway. But it was probably perfect for New York. The dress is quite voluminous, so try it at least one size, if not two, smaller than you normally wear. Saks made it easy to find the Fashion Star items, the sales associates I encountered knew all about the show, it’s premis, which items from the show were carried by Saks, where to find the garments in the store, and were thrilled to answer questions help me try them on. If I had liked the color of the dress, I probably would have bought it (and taken it to my tailor to change the neckline). Macy’s has small signs on entry doors announcing the show and a Fashion Star shopping spree sweepstakes. Inside, there is no sign of Macy’s collaboration with the show. The sales associates I spoke with had heard about the show and knew that Macy’s carried items from the show, but they didn’t know the premise of the show, which items Macy’s carried, or how to find or purchase the items. After several calls to management, one sales associated discovered that the items weren’t available at all in Houston stores. They weren’t sold out, the items just were not coming to Houston at all. Macy’s made it impossible for me to find the dress I was looking for and the sales associates were annoyed with my attempts to find and try on the dress. Bummer. Lisa Vian Hunter’s pink dress was my favorite from the episode. I liked everything about it probably would have bought it if I could have tried it on. I’m old fashioned in that I want to feel and try on clothes before I buy them to see if they fit, flatter and feel good. I don’t like buying online, so it made a huge difference that I could see, feel and try on the dress at Saks. I noticed that I stayed longer in Saks because the shopping experience was so easy. Did you try or buy any of the Fashion Star items? What did you like? What didn’t you like? I’d love to hear about your experiences! So glad Sid, thanks for visiting! !